Right. I promised i would start a sketch book just to keep track of progress and get some feedback as to where i should improve and what to concentrate on. I hope to do a mixture of PS/Sketch book stuff. Sketchbook stuff i might take a shot of the recent last few pages. So today's quick sketches: Initial lines and quick relining to see how it holds up. More practice with the tablet and maybe a check on anatomy as well. Oh dear. Its lacking depth, i really need to find a way to add depth to the person which i assume requires shading of some sort. The initial mess of lines shows potential, but not the quick trace over. Last edited by johnway : 02-03-2018 at 03:50 AM. Oh dear. Its lacking depth, i really need to find a way to add depth to the person which i assume requires shading of some sort. Cool. Afterwards i can then begin the shading process? another thing i should consider is perhaps adding a horizon line/perspective so to make sure things fit together properly or are in the same alignment. Oh, and the hands and feet might be worth a quick practice as i really didn't put a lot of effort into them apart from general shape. You can start shading whenever you want. Though it's a lot simpler when you understand the form and orientation of everything. Rubber bands make that clear. A horizon line is a great idea. Probably always. 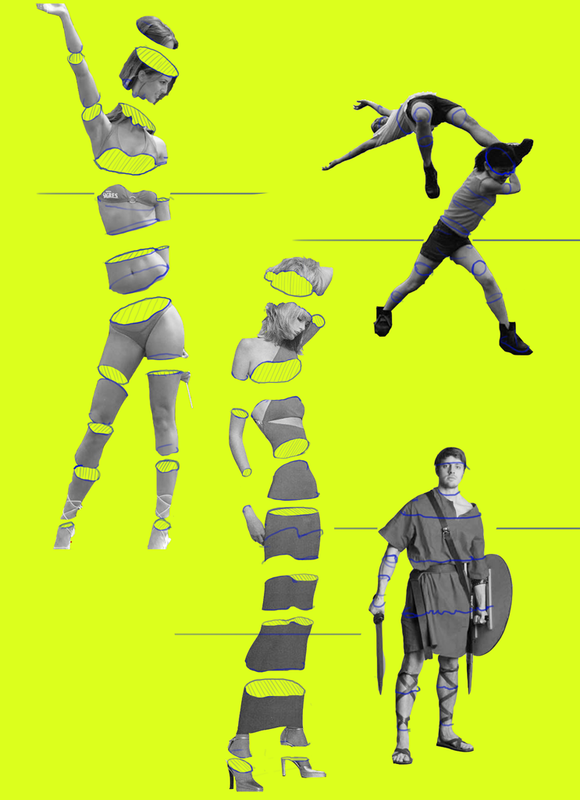 Pick a full-figure photograph of someone. Determine where the horizon line should be (and place it). 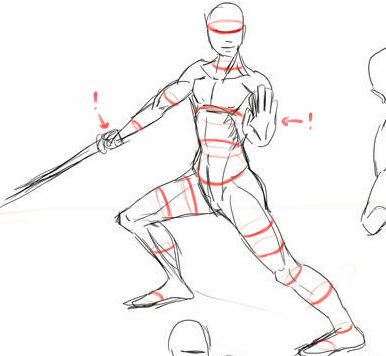 Draw rubber band lines around the figure. Check the horizon line to keep them honest. Cut up the figure along the rubber band lines and separate each section. Now draw what each cross section should look like by completing the rubber bands. You'll end up with something like this, a sense for form, and the faint suspicion you'd make a good axe-murderer. 2 more pics from yesterday. Not much to show for it other then it was for practice. On a graphics tablet. first up: Hands. Testing a few techniques and refinement. Not much to show for it tbh. Next up a picture of some figure and an angel. i added the angel last as a quick mock up to add something extra. Before it was some guy looking up at nothing so i thought i'll add something there. originally it was just a guy emerging from a cave or something but that got boring and i was running out of ideas and i wanted to do something different. Interestingly, this one i added a horizon line to the pic before drawing and either i was lucky or it really has helped. Just a post to show the fruits of todays labour. I didn't do anything stressful but it had to be done anyway and that was a study of some of the muscles on the lower arm. I've probably at learnt the ones in todays experiment and you can see that i've tried to put some of that practice into some quick sketches to see how they pan out. Whether it has improved the picture or my arms remains to be seen. Just a continuation of the arm muscles exercise and as an added bonus the muscles of the face just as a quick exercise. I would have done more but my wacom started playing up and the batteries needed charging so it was cut short a bit prematurely. Right a quick update from today. I was just practising shading and reinforced learning the arm muscles. With mixed results. Mostly crap. I had attemped to try blocking in the face and apply drawing planes, but this brought a whole world of problems. Namely i mostly guessed. Should dig out loomis book and look at them, but the big obstacle is the cheek bone area. I just don't know how to break that down to one seamless area. Ideas welcome. Right just one pic this week just to show what i've been up to. This week, i was having a quick play with anatomy and mastering the arm. Whilst at the same time practicing drawing with the graphic tablet and learning to draw objects in 3d at the same time. More practice and then we'll see where it goes, maybe learn the lower arm or something. Right a quick update. More of a highlight/fruits of my labor in the past few days/weeks. I've spent more time practicing on sketch book tbh and theres not much to that at all. Until i started to study the female body and anatomy in general and came across an artist which came up with an answer to how i could rectify my anatomy to a point that it all fit together properly or more naturally. Ok, still problems, but aside from the proportion issues and slightly awkward pose, i feel that the shape is there and at the very least more natural compared to my other stuff thus far. I can't do much with this pic for the time being and i've shelved this under: "use this for practice lighting or painting". Last edited by johnway : 10-28-2012 at 03:33 PM. right more artwork. More practice of using my tablet. This is from last week and todays work. The last one was from today. I was more practicing with my graphic tablet and trying my hand on some quick shading. Nothing fancy just to get some sense of depth and something solid to look at. With no games to play (or didn't feel like playing) I was bored today and decided to do some drawing. I won't comment much on it, but it deserves to go into the sketch book as progress when it comes to shading. Adding this to the sketch book as a record. If you're starting to work with colors/tonal values you should definitely start with references. So much of being able to digitally paint realistically is actually knowing how light bounces off of different objects, and the best way to ingrain that into your mind is to just keep on observing and practicing. The embarrassing truth is that the picture above was from reference. Anyway, after a good long chat with muzzoid (again many thanks for being patient with me. It must have been like talking to a hyperactive brick wall for you). Its time to take a step back and take things slowly for a while and develop things. Didn't have much time in the past few weeks as i'm studying for my microsoft certs. So focused on various bits of the body using refs. Last week, it was the nose. Didn't learn that much tbh. Especially with the ref pic i chose. So this week instead i went to drawing the eyes. There were a few things i wanted to know and understand (especially the upper eye lid and how it formed and why/what created the variables). Cooked up this pic -The first one was a disaster and Photoshop was trying to ruin my best endeavors by not behaving. The main focus was the eyes. The rest i sort of referenced and the mouth i just drew in as it was completely different from the ref. Not perfect the eyes, but its a start. I suppose. Only a little more testing will get me there. Probably. I'd really like to see you focus more on getting your structure perfect, and make sure your perspective right before you worry about details like eyes. Fair enough. I do have a real weakness in drawing even the most basic boxes in perspective. I did an exercise to draw some heads for practice (i was eager to try a few things i learnt a few days ago) on my tablet with focus on using shapes to draw them. My standard method is to draw just 2 line shape everything on that. 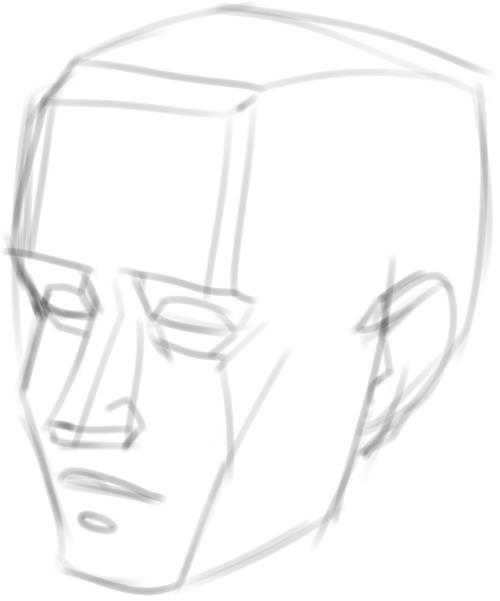 When ever i draw a square or something at the start it sort of falls apart. I did however use the cube shape when i got a bit stuck but that was during the drawing and not from the word go. The horror is that i have NO system for drawing female faces. Those are looking good man! That girls face in the middle is looking particularly ace. Some of them the structure is still a bit skewed but for the most past you are getting it a ton better. I think i'll concentrate on the forehead area as i suspect that i haven't quite got the angle right, but more importantly i need to figure out how to draw hair that doesn't look like a wig or some rigid dome piece. Plus it'll give me opportunity a way to fix the top. Too long has many of my characters been wearing hats or had no hair at all. I've heard the spiel: Draw it in clumps rather then individual strands, it radiates from one point, gravity makes it droop down. but i seem to be missing key information as to how big the clumps should be. Sure they shouldn't be universal in shape, but when and where should they be large clumps and small clumps? Where/when do i draw the spaces etc? Quick thoughts on the solution: User large brush and then soften edges so it doesn't look like a dome piece and hopefully blends in together. But i think i need to learn how people do their hair and knowing how much hair to grab and where should help. I do use http://www.ukhairdressers.com/style/style.asp to get hair styles, but they seem more for fashion then real hair. But i would like to focus more on maybe more tighter drawing. Right now the pictures all use a cookie cutter design.